One thing is for certain: folks in the Santa Barbara area who are passionate about the environment have not grown weary of vocalizing their support for it. 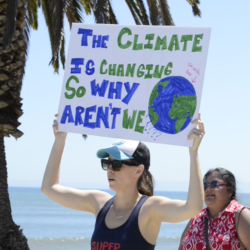 This was evident over the weekend when about 1,000 people turned out for the Santa Barbara People’s Climate Rally, held at the Santa Barbara City College stadium. 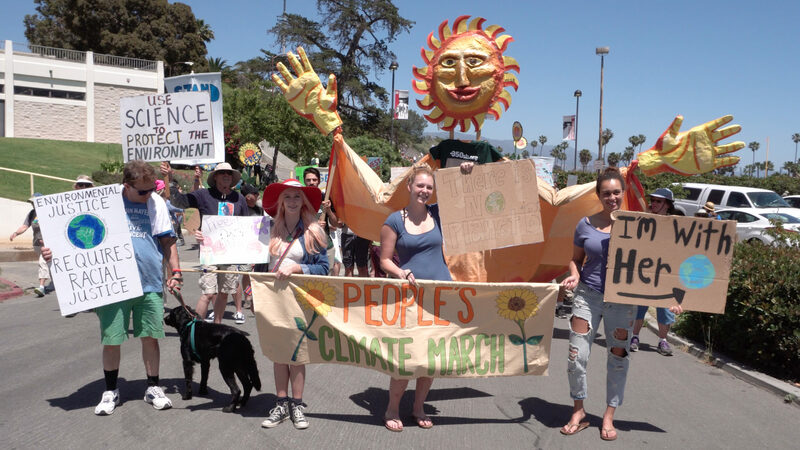 The World Business Academy was one of the co-sponsors and was joined by a broad coalition of supporters, from environmentalists and activists, to regular concerned citizens seeking climate justice. Saturday’s rally in Santa Barbara was one of about 300 sister rallies in cities nationwide, including a rally held the same day in the nation’s capital. Attendees wanted to send a strong message to the Trump administration, which wants to back out of our international climate agreements, slash funding and staff to the EPA, and increase oil drilling. Our local crowd was enthusiastic and energized. The important thing is they aren’t remaining silent. Many people on Saturday wore the T-shirts they wore the previous week to the March for Science. Many attendees attended both events and also previously attended the march to support women. Activism is alive in Santa Barbara! The World Business Academy was represented Saturday by Founding President Rinaldo Brutoco and Judi Weisbart, our Vice President of Community Relations. Together, they addressed the crowd, leading attendees through a series of pledges whereby each person pledged to lessen their footprint on the planet. Pledges included a promise to shop for locally grown and sourced food and a pledge to re-use bags. “It was really powerful,” Judi reported. Also addressing the crowd Saturday were Santa Barbara County Supervisors Das Williams and Joan Hartmann. Both urged people to attend the June 20 County Board of Supervisors meeting, where Community Choice Energy (CCE) will be on the agenda including a presentation of the long-awaited feasibility report assessing the viability of CCE in Santa Barbara. CCE is an initiative being considered by Santa Barbara County that would allow the community to have more control over how it gets its energy and how sustainable it is. So … make attending this board meeting your next action in support of a sustainable energy future! Put the June 20 supervisors’ meeting on your calendar and attend to make your voice heard once again. Judi was heartened by the great turnout and enthusiasm of the crowd at Saturday’s rally. She observed that the turnout shows that people are not getting tired of standing up for science, the Earth, women, and other important social justice issues.